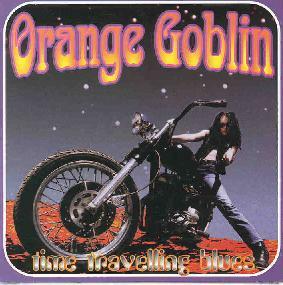 Orange Goblin - "Time Travelling Blues"
So-called 'Stoner Rock' has seemingly grown in awareness ten-fold over the last two years or so, probably in no small part to the commercial success of Monster Magnet. In ten years though, who will be the two or three artists that pass the test of time and are remembered as the stoner kingpins? I hesitate to guess, though I wouldn't be surprised to see the Goblins among them. This album really surprised me - so many doomy bands write simplistic, fuzz-heavy tunes that they hope will cover their weaknesses. I didn't go through and count the number of discrete guitar riffs on this "T.T. Blues," but there are many times more than there are tracks. Orange Goblin isn't all attitude like I thought, they are seriously good songwriters. The very best music comes early in the sequence, highlighted by "Solarisphere" and "Shine." At over 6 minutes, the former is a rare multi-phase anthem including the toned-down and melodic bridge sections and vocals by Ben Ward that thankfully stop short of being entirely derisive. "Shine" though is an absolute wonder, beginning from the Jon Lord-style organ intro by a guest identified only as Fred. The tune itself though is far more trippy and spaced-out than the average metallized band is ever arsed to create, more in the style of the Dead Flowers than Black Sabbath. The juxtaposition of quiet interludes with the all-out twin-guitar attack (Pete O'Malley & Joe Hoare) alone sets this band aside from all the others in the area of effective dynamics. Another thing that I noticed (which is very rare) is that the lyrics are of a superior quality to that which I suspect is the norm (not being particularly tuned into poetry/lyrics, mind you). For instance, over the heavy funk of "Snail Hook" Ward delivers, "A porpoise sunrise in a turquoise land, a purple turtle with his head in sand. The sweet sensation of a neon sun, my psychedelic dream has begun." Dunno what it means, but I like it. Finally, if you were wondering about the 'blues' in the album's title, indeed the final track (barring the bonus rehearsal session) "T.T. Blues" is straight from the blues-rock tradition of any number of bands featuring Paul Rodgers as vocalist, though the heavy chorus punches up the volume to unprecedented levels. I don't think it's a stretch to refer to Orange Goblin as "intelligent riff merchants," with a success ratio that rivals some of my older favorites like Diamond Head, who they even resemble at times. I haven't mentioned the rhythm section of Martyn Millard (bass) and Chris Turner (drums), so I will now since they are also first-rate musicians. It's always nice to be pleasantly surprised with an album that you were ho-hum about going in. And I only thought, "Hey...they ripped off "Children of the Grave"" twice when listening to this album, as opposed to the usual dozen or more such thoughts. Available through Rise Above Records.